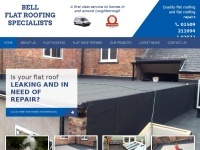 Bell Flat Roofing Specialists are based in Loughborough offering high quality flat roof repairs & various felt roofing services. Call 01509 211094. The websites creator or author is Editor.